I've never been a morning person. Heck, I wasn't even born until a little before two in the afternoon, and I've always believed that “mourning” was a better spelling of that grim part of the day before the world reaches operating temperature. It takes something pretty extraordinary to persuade me to voluntarily get up before the crack of noon, and the morning of June 8th, 2004 filled this bill beyond a shadow of a doubt. It was, in fact, the shadow of a planet, Venus, passing in front of the Sun as seen from the Earth for the first time since 1882, that caused this amateur astronomer to rise with the Sun on this providentially cloudless Tuesday in western Switzerland, to witness a spectacle I've been waiting to see ever since I was about nine years old. When it comes to spectacular celestial events predictable well in advance, transits of Venus are about as rare as they come. They come in pairs, in June or December in the present era, separated by so many years that no living human saw the last transit, and anybody who sees the next one in 2012 and the one after that in 2117 can count themselves a winner in the longevity sweepstakes. As transit day approached, I drew my plans to observe and photograph the event. Despite the poor prospects for clear skies, I operated in “success orientated” mode and planned for the best—far better to have everything ready to go and be rained out than clear skies and no film or the digital equivalent! A month ago I was invited to a seminar with a speaker who I'd usually make an effort to hear. Upon seeing that it was scheduled for June the 8th, I said, “Are you crazy? That's the transit of Venus.” They had no idea what I was talking about and no doubt sat inside an auditorium while the heavens mounted this spectacle in a cloudless sky without knowing what they were missing. Tant pis. Me, I'd mobilised all the modest resources of the Fourmilab observatory to image the transit. 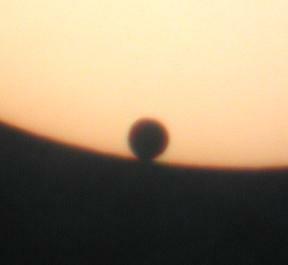 Like the transit of Mercury in 2003, this event would begin in the morning when the Sun was not far above the horizon. 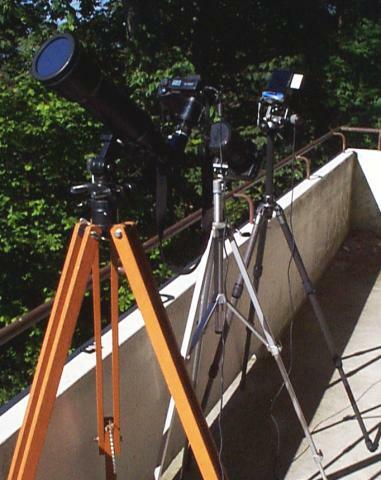 As with the Mercury transit, I commenced photography from an open window in the Fourmilab conference room, shown above at the left, with my almost twenty year old VernonSCOPE Brandon 80mm apochromatic refractor (at the left) fitted with an Orion full aperture coated glass solar filter. 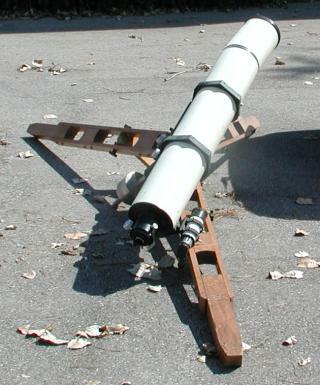 The telescope was mounted on a simple wooden tripod and altazimuth non-driven mount with mechanical slow motions. For photography, I relied upon an Olympus C-3040 digital camera. 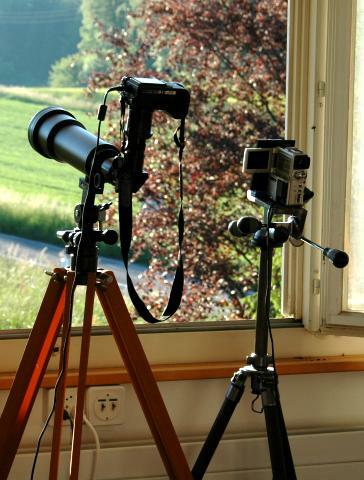 The digital camera was attached to the telescope with a ScopeTronix Digi-T adaptor, which couples a variety of digital cameras to many popular 1¼ inch eyepieces. I use the ScopeTronix ST series Plössl eyepieces with this adaptor. 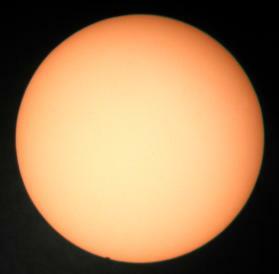 The 25 and 6mm focal length eyepieces were used in taking the photos below, with all of the full-Sun shots made with the 25mm. To the right of the telescope and still camera is the video lash-up I cobbled together the day before the transit. None dare call this reasonable, but it got the job done, capturing almost six hours of transit including viewable images of the ingress and egress of Venus from the solar disc. In another window, not visible in this shot, was my brand new Nikon D70 digital SLR with venerable Reflex-Nikkor 500mm mirror lens attached for back-up imaging. After the Sun rose high enough in the sky to be occulted by the eaves of the window I'd begun shooting from, I moved all three cameras to the unobscured balcony outside the Fourmilab conference room. In the image at the right, the Brandon 80mm with the Olympus camera is in front, the Nikon D70 with its Nikkor 500mm mirror lens second, with the Sony video camera bringing up the rear. “How did he take this photo?”, you ask. With my ancient Kodak DC120 digital camera! At Fourmilab, we never abandon aged technology as long as it does the job. Event times are for a geocentric observer. The following pictures chronicle the progress of Venus across the Sun's disc. All were taken with the Brandon telescope and Olympus camera using eyepiece projection. 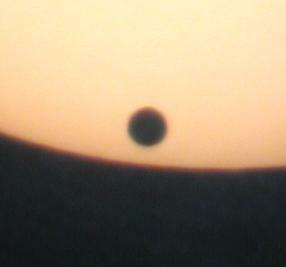 The full disc pictures used the 25mm eyepiece and the closeups of the ingress and egress of Venus the 6mm. The optical train in the telescope, eyepiece, and camera does not invert the image but mirrors it right to left. I've flipped the images so they correspond to the appearance of the Sun in the sky. I haven't rectified them—rotated them so solar north is up. 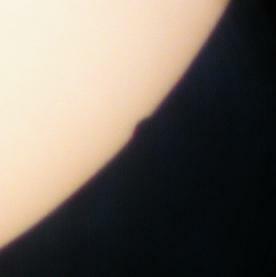 Instead, all show the Sun as it looked from my vantage point—up in each image is toward the zenith. This results in the Sun's disc appearing to rotate during the transit, which can give the impression that the path of Venus curves. It doesn't. I discuss the source of this illusion below, and why I didn't choose to remove it by postprocessing the images. Images taken with the Olympus camera were transferred to my computer, where the best were chosen for inclusion in this document. They were manually cropped using The Gimp on Linux, then bulk processed with the Netpbm image processing utilities driven by a one-shot Perl program. Some image processing and annotation was done with Jasc Paint Shop Pro 7.02, the last usable release before this once exemplary Windows product was wrecked due to Photoshop envy on the part of its developers. The table at the right gives the time of the main events in the transit in Universal (Greenwich Mean) time, along with the position angle relative to solar north. Local wall-clock time, in Central Europe Summer time, was two hours later. You can click on any of the images which follow to open an auxiliary browser window which will show the image at increased resolution. If a still-higher resolution image is available, clicking on the image in that window or the “Larger image” link below will display it. Buttons at the top right of the browser window allow you to flip through images at the current resolution. Most of these images were captured with shutter speeds between 1/650 and 1/800 second with whatever (unknown) effective focal length the telescope, eyepiece, zoom lens, and sensor resulted in. The zoom lens on the Olympus camera was set to maximum aperture and optical zoom, which minimises vignetting of the image projected by the eyepiece. Digital zoom, which expands the scale of the display on the camera's LCD reflex viewer screen, was used as a focusing aid but disabled when taking images. 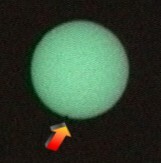 The first image shows Venus just beginning to impinge upon the solar photosphere. This precise moment is called “Contact I” or “First Contact”, and cannot be determined visually without a narrowband filter which allows you to see Venus approaching the Sun silhouetted against the corona. 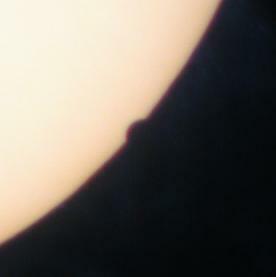 The tiny notch Venus makes in the Sun around the 7 o'clock position is easier to see in the higher resolution image; click the small image to display it at larger scale. In the next image, Venus is clearly biting into the Sun's disc even in the small image. The following images, all shot through the 6mm eyepiece, show Venus entering the Solar disc. To the eye, Venus appeared even more sharp, round, and black than in these images. I've always thought it distinctly tacky that none of the inner planets from Earth have any moons—one expects better from the Architect of the Cosmos, who went to the trouble to arrange that the Sun and Moon have almost identical angular extent as seen from Earth purely for the benefit of eclipse chasers. What a spectacle a planet and moon transit would be, and how eagerly anticipated will be the Webcast of the 2084 transit of the Earth and Moon from Mars! We are marching to Cydonia. Cydonia, Cydonia . . . These 6mm eyepiece projection images track the initial progress of Venus after Contact II. Note that in the first image there is an unambiguous separation between Venus and the Sun's photosphere. Now we follow Venus across the solar disc. If you aren't an amateur astronomer, this may seem like watching paint dry, but to solar system fans like me, it's the sight of a lifetime. All good things must end. And so, around 11:06 UTC, Venus approached Contact III—its final tangency with the solar disc until the next time in 2012. 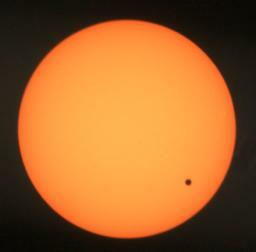 These images, the first a full Sun frame showing Venus just before Third Contact and the rest tracking its exit from the Sun, show the culmination of this glorious event. A Curved Path Across the Sun? 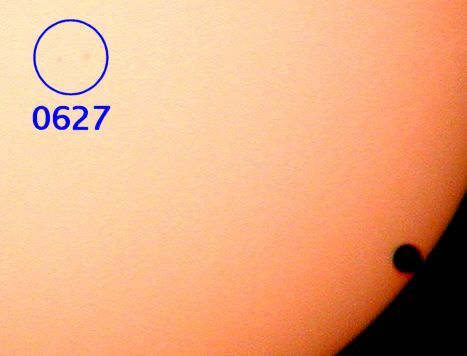 When you view the images of the transit in sequence, forming a movie in your mind, you might notice something which looks distinctly weird—the path of Venus across the Sun appears to curve! How can a planetary orbit do that? This effect is due to the transit's being photographed from the surface of the rotating Earth. 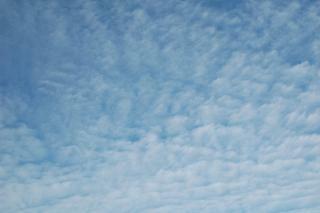 Over the six hours of transit, the Sun rose from a low altitude in the eastern sky and crossed the meridian. As this occurred, the location from which I was photographing the Sun moved across the Earth as seen from the Sun. Since there were only a few not terribly apparent sunspots on the solar disc on transit day, the only obvious point of reference was Venus itself, so the apparent rotation of the Sun doesn't jump out at you. The image at the left shows the two sunspots of NOAA solar active region 0627, imaged at 06:35 UTC on the day of the transit by the MDI Continuum instrument on the SOHO spacecraft in its halo orbit around the L1 Lagrangian point, 1.5 million kilometres sunward of the Earth. This image is rectified so Solar north is up. Now compare the orientation of these two sunspots on the disc of the Sun as photographed from Fourmilab near the start of the transit. 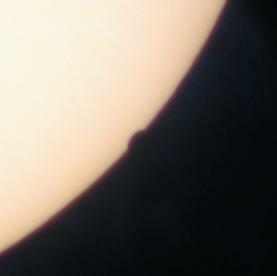 From the vantage point near the morning limb of the Earth at 47° north latitude, solar north is shifted counterclockwise around the Sun's disc, as can be seen from the orientation of the sunspots (which are never as clear when viewed with a small telescope through Earth's boiling atmosphere as from the hard vacuum whence SOHO scrutinises the Sun). 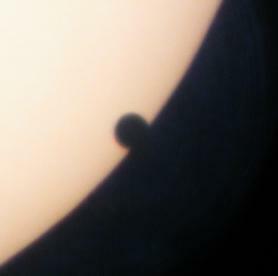 In the picture at right, taken just before third contact near the end of the transit, note that the two sunspots of region 0627 have rotated closer to their orientation in the SOHO image—as the Earth's rotation brought my vantage point toward the longitude of the sub-solar point, the apparent position of solar north shifted clockwise, rotating the sunspots closer to north up. It is this apparent rotation of the solar disc as seen from the Earth which explains the curved path Venus appears to traverse in these images. I could have rectified the images, rotating them so north was up, but I decided instead to show “what the telescope saw,” faithful to the visual experience of the transit. Oh yes, the difference in colour between the two images is due to the first being shot in the early morning when the Sun's light had to traverse far more of the Earth's atmosphere than it does at noontime—that's why the rising and setting Sun looks red. The overall yellow-pink cast of these images is an artefact of the Orion solar filter; different filters impart various tints to the Sun. Sunlight, unfiltered by the atmosphere, is perceived as perfectly white by the human eye, which is precisely what you'd expect, given that the eye evolved to make the most of that light. A few days before the transit, my eagerly awaited Nikon D70 digital SLR camera arrived. I didn't want to risk transit photography on a camera with which I'd had such limited experience and besides, the telescope I'd really have liked to use with the Nikon was out of action, injured in an automobile accident last August 25th. No, notwithstanding plastic robot ants, bending of spacetime, and stray radioactivity contributing to the entropy here, we do not allow telescopes to drive vehicles from the Fourmilab motor pool! But, I'd set up my trusty 150mm f/8 Astro-Physics refractor in the parking lot behind Fourmilab to view the close opposition of Mars. I left the telescope out as long as the weather remained good in part because it's sufficiently heavy and large that setting it up is a bit of a production, but mostly so neighbours could use it when they wished. One of advantages of living in a small village in Switzerland is that one doesn't worry about deleterious consequences of such kindnesses. Well, that just goes to show you that you've failed to worry about everything you should've! Bright and early on the cloudless morning of August 25th, 2003, in broad daylight, the postman managed to back his car into the mounting of the telescope, precipitating it onto the ground with a loud ker-ploing. The impact was just a tap, but enough to knock one of the tripod legs out of its notch in the bracing triangle. Professor Newton saw to the rest, with the massive cast-iron mount crashing to the ground, shattering itself and tripod legs as it went. As you can see from the picture, the optical tube arrived last at the scene of the accident and suffered the least. The star diagonal was snapped off and the eyepiece and finder scope ruined, but the optical train was intact. The end of the tube which appears askew is just the dew cover which readily snapped back into place. The mounting and tripod were, however, a write-off, and I haven't yet got around to replacing them, so the big warhorse was hors de combat for the transit. This was regrettable, particularly since I have a Nikon camera adaptor for this telescope which does a fine job of filling a film frame in either prime focus or eyepiece projection. Still, I had this shiny new D70 and a spare tripod to mount it on, and I wanted to see if I could put it to some use during the transit. I decided to attach the 500mm f/8 Nikon catadioptric “mirror lens” I'd used for film photography of the 1999 and 2001 solar eclipses. Given the image sensor in the D70, which is about 2/3 the size of a 35mm film frame, a 500mm focal length lens produces an image of the Sun equivalent to a 750mm lens on a film camera. This, with the D70's 6 megapixel array, has plenty of resolution for full-disc images of a transit. 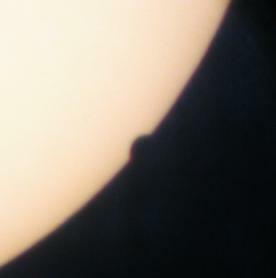 One additional complication was that I had only one full-aperture optical quality solar filter, and it was committed to the Brandon 80mm for the main photography. In order to get some images with the D70, I decided to occasionally “borrow” the filter, since its mounting fits both the telescope and the Nikon lens. The first set of images I shot were disappointing—there was a lot of scattered light around the Sun which, given that the Orion filter blocks 99.999% of the Sun's light, should be utterly black. I discovered that this was due to a combination of small pinhole defects in the filter acquired in its various travels, not as manufactured, and internal reflections between the front element of the lens and the filter. I removed the lens hood and fixed the filter directly to the lens, and the results were superb. The full disc image above is reduced from the original 3008×2000 D70 Raw mode (.nef file) frame, while the image at the left is a pixel-for-pixel crop from this image, as converted by Dave Coffin's dcraw utility on my Linux laptop. Nikon know their lenses, even if there's a mirror at the back end. Note the utter absence of residual colour in the full resolution image. The sharpness of the limbs of Venus and the Sun appears basically limited by the boiling of the atmosphere during the 1/320 second exposure time for this frame and the pixel size of the sensor given the modest size of the Sun in the full frame. I eagerly anticipate future astrophotography adventures with the D70 and getting the big refractor off the disabled list! 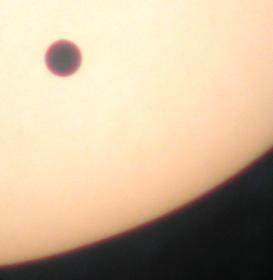 Since a transit is a dynamic event, I figured I'd try to capture it on video. I don't have any special equipment for astronomical videography (as a sharpness fanatic, the resolution of video generally leaves me cold), so my expectations weren't high, but nothing ventured, nothing gained. Having had this brainstorm just the day before the transit, I had to make do with items at hand, and that, combined with my well-known lack of shame when it comes to bricolage, resulted in the contraption pictured at left. 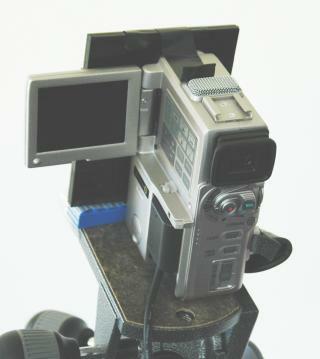 I started with the Sony DCR-PC1E Mini DV digital camcorder I bought in 1999 and have previously used, among other things, to make the video of the 1999 total solar eclipse in Iran. The CCD sensor in this camera can tolerate being aimed at the Sun as long as no auxiliary optics are attached, but the Sun's glare causes hideous lens and sensor flare which wipes out most of the image. I don't have any filters which fit the odd accessory thread on the camcorder's lens, so I first tried a pair of crossed 52mm polarisers I use with ancient Nikon normal lenses, but they still didn't darken the Sun sufficiently. I then remembered some welder's filters I'd bought ages ago for a single-photon double slit interferometer “basement science” project I've never gotten around to. These are, as I recall, number 10 or 11 density, way too bright for visual observation of the Sun (anything 12 or above is safe, but most people find filters less than density 14 too bright for comfort). 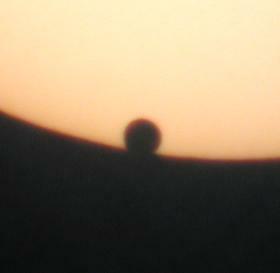 A single filter didn't darken the Sun sufficiently for the Sony camera either. (In retrospect, it might have if I'd fooled around with short image capture times and other camcorder gimmicks, but I was about to run out of sunlight for testing the day before the transit, so I didn't experiment with such refinements.) Instead, I taped two filters together with black electrical tape and discovered the camcorder imaged the Sun just fine in all automatic mode through them. To position the filters in front of the lens and keep stray light from getting in, I first mounted the camcorder on a tripod, affixed a Lego® block in front of it with strapping tape (because the filters weren't tall enough to cover the lens if placed directly on the tripod head), then used black electrical tape to secure the filters to the Lego block at the bottom and the camcorder at the top. Elegant it ain't but, hey, it works! I used the mains adaptor to power the camera throughout the transit, zoomed the lens to its maximum optical zoom focal length of 33mm (equivalent, given the sensor size, to a 420mm lens on a 35mm camera), and selected manual focus at infinity. 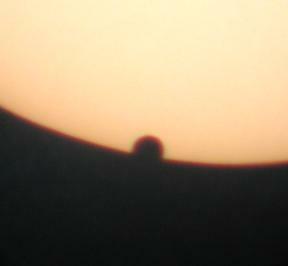 The image of the Sun was still pretty small in the frame, but it's the best I could manage. “Digital zoom”, which is just dumb pixel replication, was disabled. 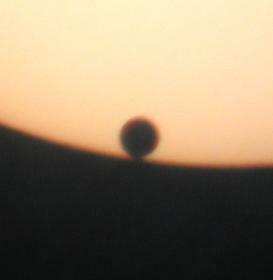 The small Sun was suboptimal for resolution, but it did mean the Sun took some time to traverse the frame as the Earth rotated. This was good because with the camera mounted on a non-driven tripod without slow motions, I only needed to adjust the aim every five minutes or so, and I had plenty of other things to keep me busy during the transit. And the results? Well, I have almost the complete transit on video, except for short gaps for tape changes and shifting the camera from the window to the balcony. The frame at the right was grabbed from the PAL analogue video feed using my ten year old SGI Indigo² workstation. This image is representative of the quality of the video, except that when the video's running Venus appears substantially more circular than in single frame grabs; the eye averages out high-pass noise from image to image. The entrance and exit of Venus from the Sun's disc are not terribly perceptible, but you can see it—the image at left was produced by adding five consecutive frames (to smooth out video noise) and shows Venus about four minutes before second contact. The bluish cast of the Sun in the video was imparted by the welder's filter plus the camcorder's automatic white balance. Venus Transit 2004: The Video isn't going to break any box-office records nor walk away with a Palme d'Or at Cannes, but I'm glad I made it; the result was well worth the minimal effort it entailed. Perhaps I'll sit back and screen it now and then during the long dry spell between 2012 and the 2117 transits! After I initially posted this page, Aldo G. Cugnini wrote to tell me about the fascinating story of the Transit of Venus March , composed by John Philip Sousa to commemorate the 1882 transit of Venus. First performed in 1883, the music was believed lost and went unperformed for more than a century. A copy of the sheet music was discovered in the United States Library of Congress, and now figures in their I Hear America Singing collection, including a contemporary performance by the Virginia Grand Military Band. This was so fantastically cool that I just had to do something with it! With six hours of transit video sitting in the can, it immediately occurred to me that a time lapse movie of the transit, set to Sousa's march, would be the perfect thing. I hooked up my camcorder to the FireWire port on my all-purpose laptop, and ran a program which grabbed a still frame every ten seconds throughout the entire six hours of video. This resulted in 1819 PAL frames of 720×576 pixels occupying 995 megabytes of disc space in lossless PNG file format. 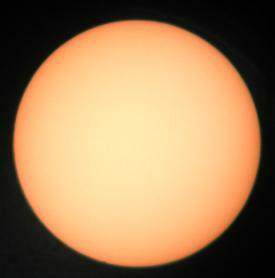 The image of the Sun occupies a small part of each frame, about 100 pixels, and since the camera was mounted on a fixed tripod which did not track the Sun (except by my manually re-aiming it every few minutes), the Sun's image drifts across the frame during the video. I wrote a little C program called cropcircle which examines each frame and determines the co-ordinates of the “centre of luminosity” of the image, after applying a threshold function to discard video background noise. This is used by a Perl program, cropomatic, in conjunction with Netpbm utilities, to extract a 160×160 pixel image with the Sun at the centre from each frame. Since I was not entirely diligent in keeping the Sun in the camcorder's view, some of these images lopped off a part of the Sun, were completely blank, or happened to be grabbed when I was re-aiming the camera and were blurred; I assembled all of the cropped frames into a preview animation with Gifsicle, stepped through it, and discarded the bad ones. I deliberately captured 50% more images than I knew I'd need to assemble the movie, knowing there'd be some attrition. Taking the frames which made the cut, I then used a Perl program to create a directory with links to frames chosen from them in sequence, dropping frames as necessary so the length of the video at the 10 frames per second rate I'd chosen would be the same as the recording of the Sousa march. I created a title sequence with Jasc Paint Shop Pro and Animation Shop, and added these frames, exported from the animation and converted to JPEG, to the movie frame directory. I then used the Audacity sound editor on Linux to add silence at the start of the sound track so the march would coincide with the movie of the transit. Finally, the title and movie frames and sound track were assembled into an AVI format movie file with the Mencoder utility on Linux. The runaway proliferation of video and audio file formats has gone several orders of magnitude past the point of absurdity. When you fire up the Mencoder program, it reports that it has loaded “66 audio & 176 video codecs”, and that doesn't count format options on individual encoders! I selected the encoding for this movie through the time-tested engineering technique of trial and error, attempting to find the best trade-off between image quality, file size, and compatibility with widely used players. I finally settled on Microsoft MPEG-4 v2 video mode with MP3 audio encoding. This results in a 7.1 megabyte file with image quality indistinguishable from the original frames. This file plays with no problems on Microsoft Media Player 9 on Windows 98/2000/XP and MPlayer 1.0pre4 on Linux. If your player can't handle the movie, well, that's too bad—I'm not going to blindly make dozens of different versions in the hope one might work with this or that player. I had originally chosen “Windows Media Video, version 2 (WMV8)” encoding, but when I added the title to the movie, Microsoft Media Player hung halfway through the title, continuing to play the audio with the video frozen. Mplayer on Linux, however, played this movie flawlessly; go figure. Anyway, the MPEG-4 v2 encoding seems identical in terms of compression and image quality, and has the additional merit of working with Media Player. All of the tools I developed to produce this movie are in the public domain and available for downloading from this site, but are utterly unsupported—you are entirely on your own. If you have a compatible player, watch the movie and see how it came out. The images get a bit blurry toward the end. As the Sun reached the meridian, I was viewing it over what amounts to a 400 metre high cliff. Hot, moist air from the plain and lake below were boiling up into the cooler air at my altitude, causing the “seeing” to deteriorate. Venus also a takes a few jumps toward the end; these resulted when the image of the Sun went out of the camcorder's field of view while I was fiddling with the telescope and eyepieces getting ready for third contact and emergence. If you do not expect the unexpected, you will not find it, for it is trackless and unexplored. Heraclitus of Ephesus, c. 540–480 B.C. How often do you get the chance to plausibly say that you may be the first person in history ever to observe a particular phenomenon, however arcane? 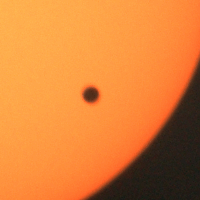 The transit of Venus afforded me such an opportunity, although I didn't see it in real time, but only when transcribing the video of the transit. While reviewing the six hours of transit video, I discovered something extraordinary. During the transit of Venus, an airliner flew in front of the Sun, and crossed Venus in transit. Now there's something you don't see every day! In fact, it's something nobody else could have ever seen before that very day, since airplanes hadn't been invented when the last transit of Venus occurred in 1882! 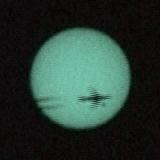 Update: at least five other people photographed airliners crossing the Sun during the transit of Venus—amazing! Thanks to Jens Peter Bork for passing on this information and pictures posted in the Venus Transit Gallery (no longer online) at NASA's SpaceWeather.com site. But how improbable is seeing something like this? Think of it as a “Fermi problem.” Physicist Enrico Fermi was known for enlivening lunches by posing questions like “How many piano tuners are there in the city of Chicago?”, then performing a rough order of magnitude calculation without consulting any references. These kinds of calculations are full of pitfalls, and I try to be extremely humble in all my ventures into probability and statistics, where subtle errors in framing a problem can yield absurdly incorrect estimates. So hold on firmly to your critical faculties—here we go into relativistic arm-waving mode. The balance of this section is rather nerdy and number-intense. If you'd rather avoid such matters, feel free to skip ahead to “ Luck and the Weather ” below. Now most of the airliners visible from a point in Switzerland are at extreme range and near the horizon, so we'll consider only planes overflying Switzerland. By measuring the size of the image of the plane against the Sun (which is about half a degree in diameter), we find it subtends a box about 30% the size of the Sun, or about 0.15 degrees. Thus, the patch of sky subtended by each airliner is the square of this, or 0.0225 square degrees. The Sun subtends 0.196 square degrees (Pi-are-square again, with its radius of 0.25 degree). The entire hemisphere of the sky, horizon to horizon, occupies a solid angle of about 20627 square degrees. The probability that a given airliner at a random position in the sky is in front of the Sun is simply the fraction of the sky occupied by the Sun, or 0.196 / 20627 = 9.5×10−6. But at any given moment, there are 119 airliners visible in the sky, so the probability that one of them is in front of the Sun is 119 times this, or (0.196/20627)×119 = 0.00113075. Since the transit lasted 6 hours, a total of 119×6=714 airliners crossed the sky, so the total probability of seeing an airliner cross the Sun during the transit is then (0.196/20627)×714 = 0.00678 = 0.678%, or about one in 147. Let's call it one in 150. This geometrically-based estimate grossly overstates the actual probability of seeing an airliner cross the Sun. Since the volume of airspace grows rapidly with the radius from the observer, most of the aircraft theoretically visible from a given point will be extremely distant, and hence close to the horizon and, even if visible, of extremely small apparent size. Further, the Sun spends only a small fraction of the day near the horizon (and none of the transit of Venus occurred near the horizon as seen from Central Europe), so the actual number of airliners which could cross the Sun is far smaller than the estimate of 119, so the real probability is correspondingly smaller than one in 150, but let's stay with that figure, which understates the rarity of the event. So, if all this arm-waving is correct (which is extremely dubious—I blow hot and cold about the analysis in the previous paragraph, and would like to try an alternative calculation based on the paths traced out by airliners on the sky against the path of the Sun during the transit if I get a chance), then the probability that any person who imaged the entire six-hour transit of Venus would see an airliner cross the Sun during the transit is one in one hundred and fifty. And how many of us did image the entire transit? The “transit and transport” picture may be something which was never seen before. If it wasn't, I'd love to see other similar pictures! Now let's compute the probability of glancing up at the sky at a random time and seeing a transit of Venus in progress at the moment an airliner is crossing the Sun. From a numerical integration study of transits of Venus, we find that a total of 1329 transits occur in the 100,000 years starting at AD 1, or an average of 1.329 per century. If each transit takes about six hours, then a total of 7.974 hours per century have a transit of Venus visible from Earth, but you can only see it if the Sun's up, so let's divide that by two, giving 3.987 hours—call it 4 hours per century. The number of hours in a century is: 100×365.2524×24 = 876606 so the probability of looking at the Sun at a random time and seeing a transit of Venus is: 4/876606 = 4.563×10−6. Now at any moment, the probability any one of the 119 airliners theoretically visible is in front of the Sun is 0.00113075, as we've already calculated above, so the probability of seeing both Venus in transit and an airliner is just the product of these two probabilities, or 5.16×10−9. The odds against seeing such a sight at a randomly chosen moment are then about two hundred million to one. In centuries before the Wright Brothers, this probability is substantially lower. Special thanks to Jack Sarfatti, Roger D. Nelson, Roger Gregory, and Peter Bancel, for contributing thoughtful comments and observations regarding this calculation. Any errors (and I am sure there are many errors) are entirely my responsibility. Now let's look at the geometry of the event. We start with the position of the Sun and Venus in the sky, courtesy of Your Sky . The ephemeris of object positions at the bottom of this page shows the Sun was a little more than 50 degrees above the horizon at the time (around 8:54 UTC, about half an hour after mid-transit) when the plane crossed the Sun. Let's start by estimating the distance to the plane from my observing site. We can do this by projecting a vector from the site to the Sun, then calculating the distance at which it intersects the estimated altitude of the plane. While I chose 40,000 feet when estimating the number of planes visible at once from a site, this was in order to err on the high side to avoid over-estimating the rarity of the event. An altitude of 35,000 feet, or about 10.5 kilometres, is a more typical altitude for air traffic within Europe, so we'll use that in the following calculation. Knowing the angular altitude of the Sun (50°) and guesstimating the altitude of the plane (35,000 feet) gives us a right triangle with a known angle and opposite side for which we require the hypotenuse (distance from observer to the plane), which elementary trigonometry gives as (35000 / sin(50°)) = 45689 feet, or about 14 kilometres (8.65 miles). Next, let's check the plausibility of the distance estimate and try a different way to calculate the distance. Close examination of the slow motion image of the plane crossing the Sun shows its path across the Sun's disc to be about 89.5 pixels long, thus 89.5% of the Sun's 100 pixel image, taking a total of 13 PAL frames of 1/25 second each for the nose of the plane to cross from one limb of the Sun to another, thus a total time of (13/25)=0.52 seconds. 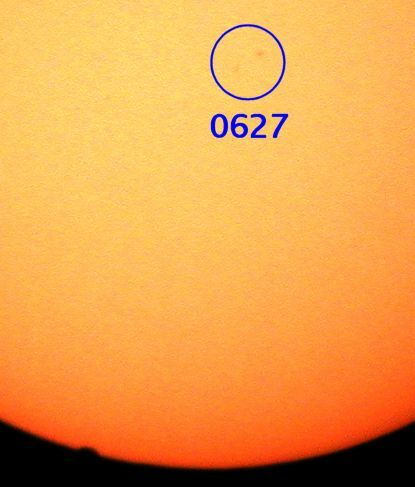 Knowing that the Sun's disc subtends about half a degree (actually 0.5252 degrees on the day of the transit, according to Home Planet ), this gives the angular velocity of the plane across the Sun as (0.5252 × 0.895) / 0.52 = 0.9 degrees per second. Now linear velocity is simply the product of angular velocity in radians per unit time and the radius of the circular motion, so taking 14 km as the radius and the angular velocity in radians (0.9 × (Pi/180) = 0.0157 radians/second), we calculate the plane's velocity as 219 metres per second, or (there being 3600 seconds in an hour and 1000 metres in a kilometre), 788 kilometres an hour. This is a perfectly reasonable estimate, given the uncertainties and hand-waving involved in the calculation. A Boeing 737 or Airbus 320 has an economical cruising speed of around 840 km/hour, which is well within the margin of uncertainty in the speed we estimated, particularly since all of this is based on a guess of the altitude of the plane. We can also run the calculation the other way and estimate the distance to the plane without reference to its altitude. By assuming the plane's velocity to be 840 km/hour, we can calculate the distance from that and the angular velocity, yielding a distance of 14.86 km, comfortably close to the 14 km we estimated originally. Finally, from an estimate of the distance to the plane and its apparent size projected against the known angular extent of the Sun's disc, we can estimate the actual size of the plane. Let's split the difference between the two distance estimates, giving a distance of 14.43 km. The length of the fuselage seen against the Sun is about 30 pixels and the wingspan 26 pixels (recall that the Sun's image is 100 pixels and that the Sun subtends 0.5252 degrees). The length and wingspan are then calculated simply as the sine of these angles times the distance to the plane, which yields an estimated length of 39 metres and a wingspan of 34 metres. The actual fuselage length of Airbus 320 is 37.57 metres with a wingspan of 33.91 metres; the corresponding figures for a Boeing 737 are 36.45 and 28.88 metres, respectively. Again, within the unavoidable uncertainties, “the numbers work”. Lest I leave you with the mistaken impression that western Switzerland is some kind of clear sky paradise, here is a picture of the sky in which the transit occurred, taken less than seven hours after it ended. 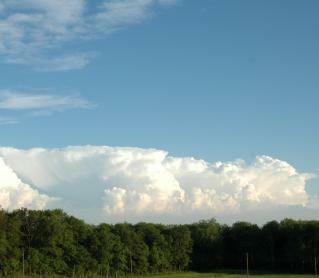 To the south, orographic anvil clouds were boiling up over the Alps and beginning to darken into thunderheads. 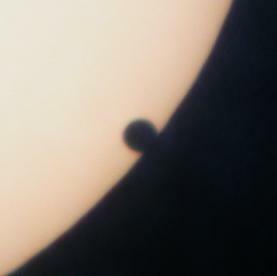 I was phenomenally lucky with the weather for this transit (as I was as well for the transit of Mercury in May 2003—it is not uncommon to get two straight weeks of clouds and drizzle at this time of year, and some estimates put the probability of cloudless skies for the transit below 5%.) I have been clouded, snowed, fogged, and rained out of November's Leonid meteor shower for twelve consecutive years here. Whether due to pure luck, somebody up there looking out for amateur astronomers, or the collective effects of wishing for good weather, the sky couldn't have smiled any more kindly on Fourmilab on transit day. Thank you, atmosphere! 1874 Dec 09 04:05 832"
1882 Dec 06 17:06 634"
2004 Jun 08 08:19 627"
2012 Jun 06 01:28 553"
2117 Dec 11 02:48 724"
2125 Dec 08 16:01 733"
If you regret missing this transit, whether due to weather, location, or lack of foreknowledge, be sure to mark your calendar for the next: June 6th, 2012. Transits of Venus come in pairs, separated by intervals longer than most present-day human lifetimes. If you miss the 2012 event, you'll have to wait until December 11th, 2117 for the next! 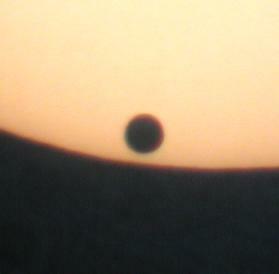 The 2012 transit is visible in full for most of the Pacific Ocean, Australia, east Asia, and Alaska, but is visible in part (the Sun sets before the transit ends or rises while it's already in progress) for most of the inhabited portion of the Earth.